shelookRED is an exclusive trademark of PT. Inti Kapuas International. 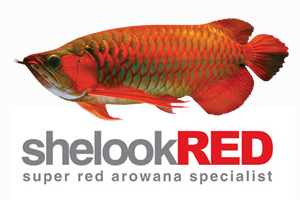 shelookREDword (she looks red) which literally translates as: She (the woman) look red, are meant to describe the beauty of Super Red Arowana like a beautiful girl with a red hue. The word of shelook is a rewrite of silukword that in the interior of Kalimantan native language community means arowana. Arowana shelookRED is the result of a rigorous selection process in maintaining genetic quality and optimal anatomical shape of arowana fish. All shelookRED fish has cultivated and maintained in a controlled environment and are closely monitored by Arowana specialists. PT Inti Kapuas International as shelookRED trademark holders are Indonesia’s largest breeding and distribution company of Super Red Arowana. Currently PT Inti Kapuas International operates five farms in various locations and six Proshops throughout Indonesia. As a major player in the industry Ornamental Fish Arowana, PT Inti Kapuas International recognizes the importance of the role of the company in conservation programs and initiatives to cling to the International standards in trade activity. Therefore, IIKP only sells Super Red Arowana breeding results, not the wild catch. PT Inti Kapuas International commitment in the conservation program has been officially confirmed by the registration of registration number CITES A-ID-519 for shelookRED brands and A-ID-528 for brand of TreasuREDragon. Specifically, each Arowana Fish for sale was registered and given a microchip, accompanied by an official certificate in accordance with applicable regulations. Is a campaign which was carried by shelookRED about super red Arowana fish as one of the treasures of Indonesia. Super Red Arowana fish is indeed an ‘icon’ arowana that we must preserve. Total population in Sentarum Lake began to decrease, although there is still reportedly arowana fish that live in the Meliau Lake, one of the lakes in the cluster of Sentarum. Fortunately, many people are finally aware to protect nature including DayakIban community as a local resident. As one of the rare fish in the world, is worth all the parties involved to preserve these animals full of charm. shelookRED is one form of real concern of PT Inti Kapuas International in preserving the Super Red Arowana population, which bred in captivity and certified official. shelookRED also authorized to cooperate with the “big family” Sea World Ancol, so the general public can enjoy and learn more about this Indonesian “national treasure”.